Osteoporosis refers to the loss of bone tissue. It commonly affects women after menopause (cessation of the menstrual cycle in women). During menopause, bones tend to lose calcium rapidly primarily because of the decreasing levels of the hormone estrogen. Prior to menopause the bones go through a breakdown and re-growth cycle. The bone tissue breaks down (resorption) and is replaced with new bone tissue (formation). 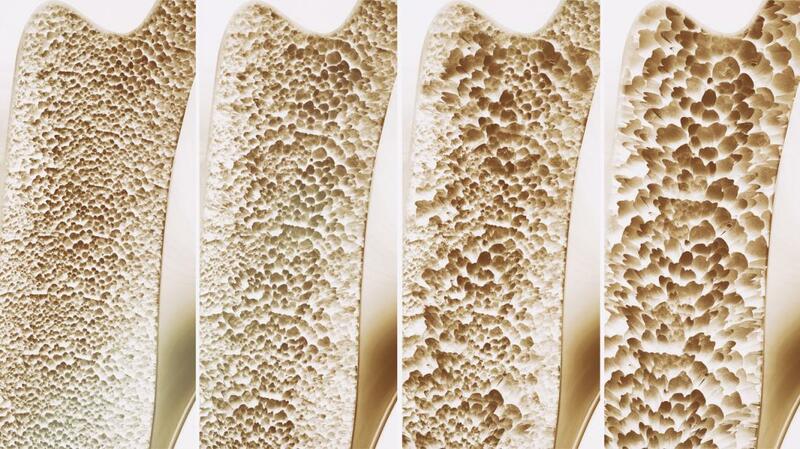 After 35, most people begin to experience a little more bone loss than growth and this is considered normal. With osteoporosis, however, loss surpasses growth and the bones become porous, thin, brittle, and subject to fractures (breaks). Though osteoporosis can affect anyone, approximately 30% of all women older than 50, currently have osteoporosis. You have an increased risk of developing osteoporosis if you are a woman, if you are Caucasian or Asian and if you have a family history of osteoporosis. Other factors include a hysterectomy (removal of ovaries before menopause); aging; insufficient calcium or protein in diet; sedentary lifestyle (no exercise), thin body frame, crash diets common in anorexia nervosa or bulimia, alcohol, smoking, side effects from certain medications (steroids, anti-convulsants, or diuretics); hypothyroidism and cancer. Diagnose the disease by asking about your symptoms, doing a physical exam, measuring height yearly, and ordering x-rays. Prescribe estrogen hormone supplements or medications like calcitonin to help bones maintain calcium and slow down bone loss. Prescribe vitamin D (helps calcium absorption) and calcium supplements. Recommend a special back brace to support the spine. Perform a regular Pap smear (gynecological exam), breast exam, and routine mammograms if you are taking estrogen supplements to screen for cancer. Exercise daily. Brisk walking, low impact aerobics and tennis can strengthen bones and decrease bone tissue loss. Eat a balanced meal with plenty of calcium, vitamin D and phosphorus. Foods rich in calcium include milk, cheeses, fish (sardines, salmon), and green leafy vegetables. Protein also helps with calcium absorption. You need at least 1500mg of calcium per day. Avoid caffeine (e.g., coffee, colas, caffeinated teas) and alcohol because they actually help to deplete calcium from your body. Talk to your doctor about diet and exercise. Take all medications and supplements as directed by your doctor. Avoid activities that may cause falls and injuries (slippery floors, high-impact exercise). Wear your back brace daily and sleep on a firm mattress. Perform self-breast exams if you take estrogen supplements. Report any lumps or breast changes to your doctor as soon as possible. Get treatment promptly for any injury. Sufficient calcium in the diet, exercise and estrogen supplements may actually slow or eliminate bone loss and prevent osteoporosis. Some complications may include multiple body fractures (spine, hip, and wrist); chronic pain and permanent disability; and pneumonia or blood clots that develop from prolonged bed rest after suffering a fracture. Contact your doctor if you are at high risk for developing osteoporosis, or if you have osteoporosis and suffer increased pain or side effects from the medications. Seek immediate medical assistance if you suffer any injury or you suspect a bone fracture!